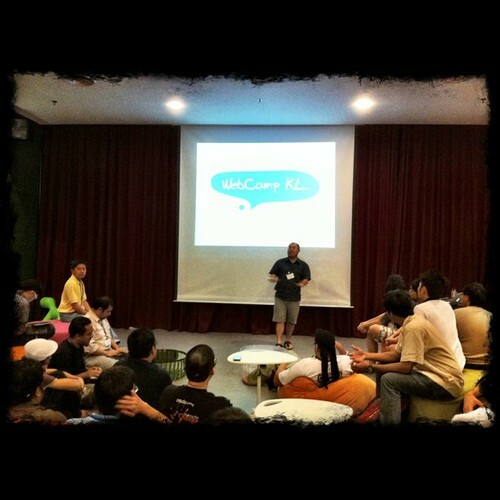 Finally attended WebCamp KL‘s seventh event . I found out about this after the Red Dot Ruby Conf in April when I got to talking with the KL Rubyists (@Anonymouscow and @bryanritchie). Lucky Chin was able to make it for the event else I would prob get lost in KL’s public transport. The sessions today was a new format for the guys (something I saw after Red Dot Ruby which is a Pencha Kucha presentation format (20×20 : 20 slides , 20 seconds each). It’s for the brave souls who can really cut straight to the point. Ruben Tan @roguejs shared more about the benefits of Git Workflow which I enjoyed the most since we’re constantly looking to improve the deployment process. 40 square’s Git workflow. Wu Han @Ngeow also shared some insights from a recent diving trip and some app ideas. I quite liked the mechanic app. They also experimented with Slideshow Karaoke .. which you really need to have the guts to stand in front of an audience and have zero idea what slides you need to present and just go with the flow. Awesome effort by the first speaker who had transformed the “art of powerpoint presentation” to “dating”. The Top 20 indian movies and lastly a M$ Enterprise Product slidedesk was pretty ironic considering the crowd. All in all, a pretty good session. Something regular and not what I’ve seen much in Singapore (for such a large crowd). Looking forward to the next session! → Apples invading the home!